For teriyaki dressed with a slightly sweet gravy, the rich fat of Tochigi Wagyu adds a glossy finishing touch. 1) Mix sake, soy sauce, mirin and sugar and set aside. 2) Place beef in a hot frying pan and lightly brown the surface over high heat. 4) Sauté until the liquid has evaporated. When the loaf is thick, temporarily remove the beef from the pan before it is fully cooked, boil down the gravy and dress it on the beef retuned to the pan. 5) Cut the beef in suitable sizes and place it on a dish. Pour the gravy over it and sprinkle powdered sansho on it in accordance with your taste. Tochigi Wagyu is fed abundant pasture grass and rice straw during the early stage, and carefully selected feed mainly containing barley at the later stage. 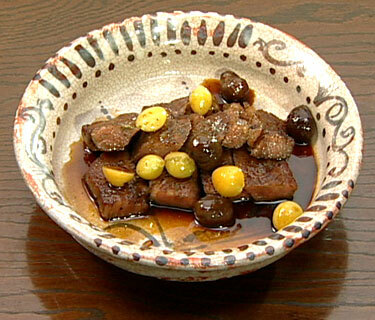 Its meat is flavorful and has a fine texture. Poke the beef with chopsticks. If the chopsticks penetrate the beef without any resistance, it is overcooked. Remove the beef temporarily while it is still firm and there should be a slight resistance against the chopsticks.